The Lincoln Memorial was built to honor Abraham Lincoln, the 16th president of the United States. Lincoln was a lawyer and member of the House of Representative before being elected President. He led his country through a great crisis, the Civil War. This helped preserve the United States. He was an opponent of slavery and issued his Emancipation Proclamation in 1863. Lincoln's assassination shortly after the war, in April, 1865, shocked and saddened the nation. The Lincoln Memorial is located in Washington DC, on the National Mall. Limestone from Indiana and marble from Colorado were used to construct the building. It was designed by Henry Bacon in the Greek Doric temple form, and it was dedicated on May 30, 1922. The seated statue of Abraham Lincoln was sculpted by Daniel Chester French. Lincoln faces the Washington Monument, looking out over the reflecting pool. The site is administered by the National Park Service. • Nevada - Find travel information, maps, tourist resources, and more photos of Nevada. 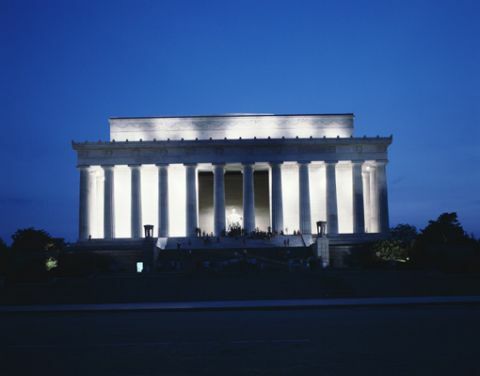 • Lincoln Memorial - Learn about this Washington, DC memorial at the National Park Service website.